Washington Is Already Playing Games With Your Health Insurance; Why Can't You? It promises to be more fun than the truth (since there was so little truth in the promises.) Affordable healthcare for all! With all the amazing efficiency our government is known for! You can even keep your old plan if you want…or at least the letter telling you it's been cancelled. So put your logic on hold and play along with the rest of the nation in this clever and comical send up of one of the craziest schemes ever foisted on the American taxpayer! 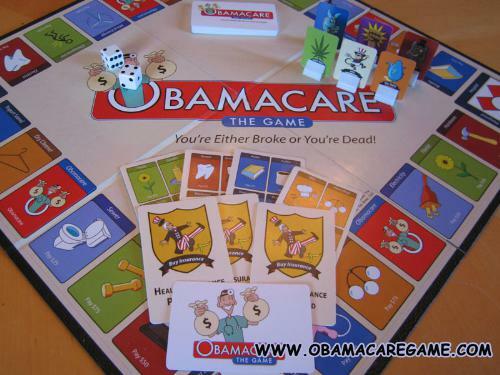 Unlike the real program, everybody doesn't have to play, but you and your friends will want to enjoy the zany fun of Obamacare The Board Game. Obamacare The Board Game features a colorful layout, creative action cards, and a fun style of play that humorously points out the finer points of the inaptly named Affordable Care Act. Players can choose the Tea Party, Democratic, Republican, Green Party or Occupy Wall Street, while facing an added player – The IRS. Each player starts out as a small business owner (except the Occupy Wall Streeters, who start out unemployed). Along the way, you are taxed, troubled, hospitalized, or may even fall victim to a Death Panel as you make your way around the board. The wryly humorous board game is made in Louisville, KY, so it supports American manufacturing, and will be taxed and troubled like any other small business. It's more fun than a Death Panel, and the ultimate gift for frustrated fiscal conservatives and disillusioned Democrats alike. Order yours today at www.obamacaregame.com.